These examples show how to perform basic save and restore operations using BacPac for OpenVMS. 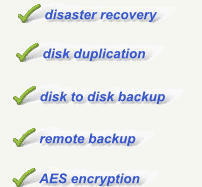 BacPac can backup files, directories, or entire disks to disk or tape. BacPac syntax is similar to OpenVMS Backup syntax and many of the command qualifiers are similar. Save Examples Save a directory on a local disk to a saveset on a local disk. Image save of a local disk to a saveset on a local disk. Image save of a local disk to a local tape drive. The local tape drive should be loaded with an initialized tape, but not mounted. BacPac will mount the tape. The default tape label for BacPac is BACPAC, but you can change this using the /label qualifier. Restore Examples Restore a directory to a local disk from a saveset on a local disk Image restore of a local disk from a saveset on a local disk. Image restore of a local disk from a local tape drive. Image restore of a local disk from a local tape drive. The local tape drive should be loaded with the backup tape, and can be mounted or not mounted. If the tape is not mounted, BacPac will mount the tape.